Petroleum-based plastics have only in the last several years been discovered to be an unmitigated disaster. Oceans are being filled with this mess of nonbiodegradable poison that cannot be cleaned up. Plastics, their additives and toxins attached to them in the oceans enter our bodies and damage our hormones and genes. So, is it agroplastics to the rescue? - Monocrops of corn, for example, are usually genetically modified organisms (GMO) that are designed mainly to tolerate great quantities of petroleum herbicide and pesticide. - This means huge quantities of the chemicals are sold by the maker, such as Monsanto, in order to kill all other species in the field. - As with non-GMO crops, massive amounts of natural-gas based fertilizer are involved for agrofuels and agroplastics. This is part of the embedded energy of foods and agricultural products that aren't sustainably produced. - The poison residues in the surviving, intended crop (or biomass that's not necessarily food for humans or animals), to be eaten or burned or refined, are therefore very high or higher than non-GMO crops' residues. - Soil depletion is ongoing, along with nitrogen oxide released as a greenhouse gas (through tilling, a problem in "organic" farming too). The problem is exacerbated if "waste" crop residues are removed, depriving the soil of replenishing itself. (See our report "Peak Soil", link below). - The agrofuel ethics (or lack thereof) regarding the appropriation of food resources-for-fuel -- driving up food prices that have thus become linked to oil prices -- are the same for agroplastics. Third world peoples suffering the effects of the “biofuel” boom say the word “biofuels” is incorrect. Peasants have used biofuels (life-energy) for thousands of years and as small-scale fuel production integrated with food production for use in household and local energy supplies. Large-scale fuel production for export demand with huge plantations of monocrops is not biofuel but agrofuel, using oil-based pesticides and fertilisers, exactly like industrial agriculture. It’s widely known that industrial agriculture is a major contributor to climate change." 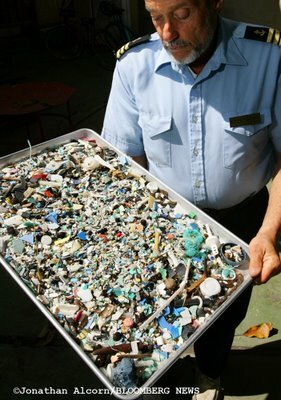 Captain Charles Moore, who discovered the floating plastic plague in the Northern Pacific Ocean little more than a decade ago, told Culture Change "The corn based PLA plastic is definitely a problem for the ocean; although it will biodegrade in my compost pile, it requires heat which doesn't exist in the ocean. There are, however, bioplastics that will degrade in ocean water, such as PHA by Metabolix and the starch trash bags by Biobag. Metabolix will be marketing agricultural film soon which will be a boon." I learned a lot. I admire the stand you took and the fact that it could get into a scientific journal. I should see more articles that address the preponderance of non-100% biodegradable bioplastics and also the partial petroleum content of (most?) bioplastics. Can trade groups be trusted? Anti-bag ban types seemed to be exaggerating what they told me about petroleum content. What society has to figure out is the appropriate use of land for bioplastic crops which presently depend on petroleum and tilling, both being unsustainable and climate-killers. Of course we wish plastics that truly biodegrade would prevail in the market place or become mandated by government fiat, but a phase-in could be long and damaging. One must question the alleged need for the products of plastic and bioplastic by a huge population. Maybe the Depression will take care of the problem of consumption far more than activism and science. I see big changes ahead, but can't say when -- at some point with fewer people and lower per capita consumption, the idea of "green consuming" sounds more realistic. Meanwhile I want to be most effective for the oceans and as always look to your guidance. With the Depression now intensifying, threatening the consumer economy responsible for disposable plasticjunk, not only could the rise of agroplastics not become a major issue; fields will be needed anyway for growing food and becoming grasslands for the buffalo, for example, in what is now Corn Country. Each year over 140 million tons of petroleum- based polymers are produced worldwide and used in the production of such plastics as polyethylene, polystyrene, polyvinyl chloride, polyurethane, and others. Mostly using oil, coal, and natural gas as raw materials for their manufacturing, these plastics are common in every facet of our lives from the pharmaceutical industry to household use. Approximately 10% of all the oil and gas that the United States produces and imports is used in the production of synthetic plastics, and the market is expected to grow at a rate of up to 15% per year. While these products hold up well to our fast-paced, throwaway society, disposed plastic materials can remain in the environment for up to 2,000 years and longer. In 2005, the U.S. Environmental Protection Agency (EPA) stated that of the 4.4 million tons of synthetic plastics discarded in the United States, only 5.7% was recovered and recycled, with the rest ending up in landfills, lakes, and oceans. This statistic highlights the need for a renewable, all-natural replacement for petroleum-based plastics. In July 2007, Metabolix Inc., of Cambridge, MA, first test marketed its fully biodegradable performance bioplastic, Mirel, to 129 Target Corporation department store chains across the United States. Mirel is a product of corn sugar fermentation with proprietary genetically engineered bacteria. ‘‘The Target gift card can completely biodegrade in a home compost in about 40 days,’’ says Brian Igoe, vice president and chief brand officer at Metabolix. The name Mirel is meant to imply ‘‘miracle of nature.’’ When asked about details on the process Metabolix uses to derive over 80% dry weight in bioplastic polymers, polyhydroxyalkanoates (PHAs) from its fermentation process, Oliver Peoples, Ph.D., Metabolix cofounder and chief scientific officer responded, ‘‘We don’t disclose how long the process takes from start to finish, but I can describe the steps involved: we feed corn sugar to our engineered microbes inside fermentation tanks. The microbes then convert the corn sugar into complete bioplastic polymers within the cells. This is the way the microbes store energy, just as humans store fat. We then extract the Mirel and turn it into resin pellets.’’ The biggest selling point for Mirel, though, is that it is a fully biodegradable biopolymer. French chemist and bacteriologist Maurice Lemoigne first discovered that Gram-positive bacterium Bacillus megaterium produced an intracellular biopolyester, polyhydroxybutyrate (PHB), while working at the Lille branch of the Pasteur Institute in 1926. Today, PHBs are recognized as one of the most commonly derived forms of polyhydroxyalkanoate (PHA). Since then, over 100 PHAs have been identified from a wide range of microorganisms found in the environment. Lemoigne’s discovery, however, would have to wait for nearly 55 years before it would become fully appreciated. It wasn’t until the 1980s that chemists and biologists began to seriously consider petroleum-based plastics as a grosswaste product problem. An intensive search began to look for new ways to make them degrade in municipal and industrial waste facilities. This experimentation period led to the discovery that chemical additives and certain strains of genetically altered microorganisms could help accelerate the breakdown of petroleum-based plastics to a limited extent. Additionally, it became apparent that the biobased bioplastic material, like polylactic acid (PLA), could be derived from the microbial fermentation of natural substrates such as starch and oils. Each of these bioplastics had their own properties that made them useable in various fields, such as medicine, automobile manufacturing, packaging, and others. The most significant aspect of bioplastics was that they could be made from entirely renewable resources. It was during this experimental time period in polymer science history that Peoples, then molecular biologist from the University of Aberdeen in Scotland, came to the Massachusetts Institute of Technology as a research scientist to work on the genetic engineering of microorganisms that make bioplastics. He and an MIT colleague, Anthony Sinskey, Sc.D., successfully isolated the first enzyme in the biological process to make bioplastic, a thiolase. ‘‘In the mid-to-late 1980s, we found the genes needed to make bioplastic, and we filed the first patent applications in 1987,’’ Peoples said. However, the patent applications did not issue until 1993, one year after Peoples and Sinskey founded Metabolix, Inc.,a bioscience company, they conceived as an answer to renewable and sustainable solutions for petroleum-based plastics. ‘‘From there it took a few years to develop the first generation of commercial PHA producing strains,’’ he explained. In 1990, the British company Imperial Chemical Industries (ICI) developed a bioplastic called Biopol made from PHB that once buried in soil, was broken down by microorganisms in a matter of a few months. This led to a bioplastic revolution, resulting in a number of large-name companies such as Du Pont, Proctor and Gamble, and Exxon all joining the hunt. Although numerous attempts were made to make the production of new bioplastics economical, the cost was not able to compete with petroleum-based plastics. In addition, the stability and quality of the bioplastics were combined with their biodegradability. Problems with the term ‘‘biodegradable’’ prompted the American Society for Testing of Materials (ASTM) and the International Standards Organization (ISO) to come up with an official definition for biodegradable as follows: ‘‘capable of undergoing decomposition into carbon dioxide, methane, water, inorganic compounds, or biomass in which the predominant mechanism is the enzymatic action of microorganisms, that can be measured by standard tests in a specified period of time, reflecting available disposal condition’’ (www.astm.org). Usually, before a company introduces a new bioplastic resin (as pellets) to the commercial market, an independent life cycle assessment (LCA) report is ordered to examine the impact on the potential of the bioplastic to replace petroleum-based plastics. Prospective buyers of the bioplastics can read the LCAs and identify the products with superior properties. To assess the LCA of Metabolix’s new biopolymer Mirel, Bruce Dale, Ph.D., a professor of Chemical Engineering and former chair of the Department of Chemical Engineering and Materials Science at Michigan State University was hired to assess the LCA of Mirel. His conclusions, based on a case study, were that ‘‘Mirel can provide 200% reduction in greenhouse gas emissions along with an over a 95% reduction in the use of nonrenewable energy as compared to petroleumbased plastics’’ (Kim and Dale, 2008). While none of the bioplastic resins on the market today meets the need for every petroleum-based plastic product made, the race is on to see what company can make the most useful, economical, and fully biodegradable bioplastic. While bioplastics such as PLA are compostable, they are not fully biodegradable. In 2006, Metabolix formed an alliance with the Archer Daniels Midland Company (ADM) and announced that they will begin to produce 110 million pounds of commercial grade Mirel annually starting in the second quarter of 2009, through a joint venture they call Telles, a name derived from an ancient Roman earth goddess, Tellus. ADM is known for working with farmers and processing the crops to make food ingredients, animal feed ingredients, renewable fuels, and naturally derived alternatives to industrial chemicals. The new state-of-the-art bioplastic microbial fermentation facility is nearing completion in Clinton, IA. The facility is conveniently located adjacent to ADM’s wet corn milling plant, where the corn will be separated into grain, starches and sugars, allowing Metabolix to pipe in the corn sugar component for the fermentation process in its bioreactor factory. Can Bioplastics Be Competitive during a Recession? The big question facing all companies making biopolymer products is if they can weather the economic storm during the current challenging time period. At this time, Metabolix is selling Mirel pellets at $2.25 per pound, which is three times higher than the price of polypropylene. Metabolix’s Brian Igoe says, ‘‘We don’t compete on price for market share because we’re positioned as a premium product with premium environmental attributes. It’s especially applicable for the packaging of high-end products such as cosmetics, or for applications such as agricultural mulch film that can be tilled into the soil to eliminate waste while saving farms retrieval and disposal costs.’’ Thus, only time will tell if the Mirel proposition holds up. Kim, S., and Dale, B.E. (2008). Environ. Sci. Technol. 42, 7690–7695. Moore, C.J. (2008). Environ. Res. 108, 131–139. Barry E. DiGregorio (barry.dig "at" verizon "dot" net) is a science writer based in Middleport, New York. Chemistry & Biology 16, Elsevier Ltd. Activists are a threatened species, but there's safety in numbers. If you can't be active, please $upport your local Earth activist. This article and graphics are published under Title 17 U.S.C. Section 107. See the Fair Use Notice for more information.